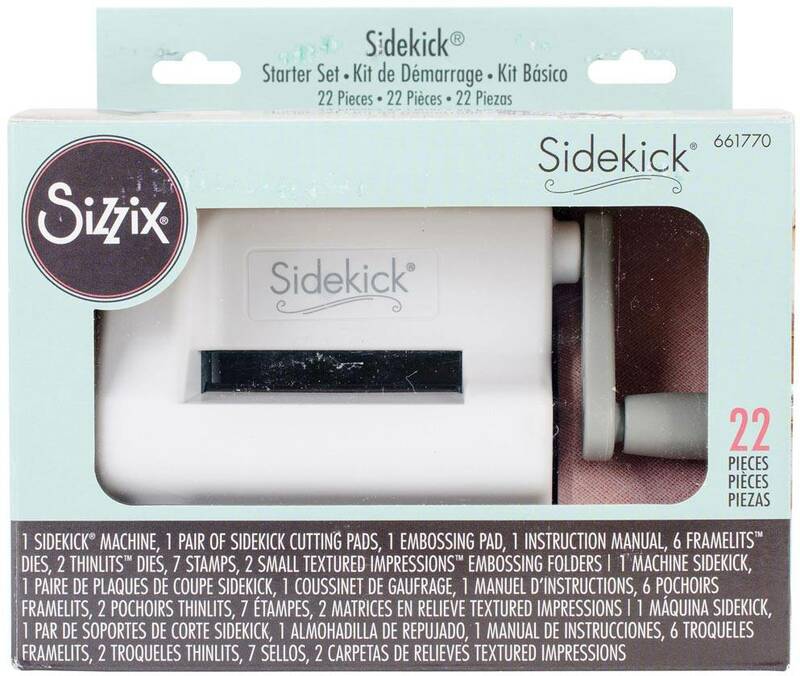 Sizzix-Sidekick Starter Kit. This portable, affordable and adorable crafting system designed for detailed (plastic backed or wafer-thin) dies and embossing folders up to 2.5 inches wide, including Sizzix 12 inch Decorative Strip dies. The Sidekick will cut a single sheet of lightweight to cardstock paper. Aqua cutting pads and embossing pad makes all Sizzix thin dies and embossing folders up to 2.5 inches compatible and works with other brands' dies.This small roller machine weighs 2 pounds, stands 4.75 inches tall and features a three-year limited warranty. This package contains one Sidekick machine, six Framelits dies, two Thinlits dies, two small Textured Impressions embossing folders and seven stamps. WARNING/ Choking Hazard, small parts. Imported.